Finian Road Image & Design • The Blog: The Little Moment: time's ticking down! The Little Moment: time's ticking down! The gift certificates are prepared and ready to be sent off to the lucky winners...are you going to be one of them? There's three fabulous prizes to be given away to one of the new subscribers to "The Little Moment". The deadline's coming up quickly (11:59 p.m. on Wednesday, January 31st), so don't miss your chance! Click here to sign yourself up for "The Little Moment"
Forward the link to anyone you think might be interested...after all, if they win the prize, and list you as the lucky peep who referred them...then you'll win the same prize! Don't wait...just a few days! 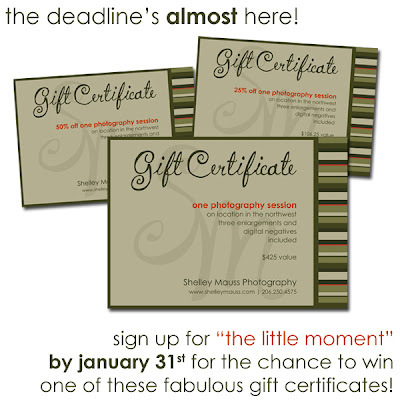 The lucky winners will be announced in the first edition of "The Little Moment", due in February!